Timber Springs Dental provides a warm, friendly environment where consideration is given to each patient's comfort. Our office has a cozy, welcoming area for our patients so they can feel at home. 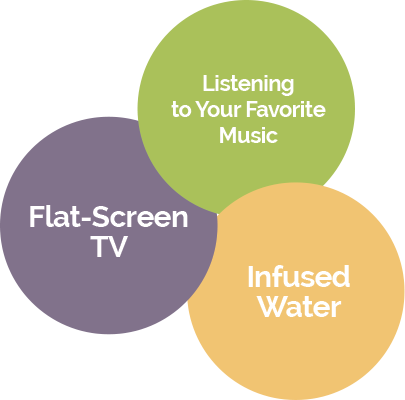 We also offer flatscreen TVs or music during your appointment to help you to be as relaxed as possible while receiving treatment. Visiting a new dentist can be stressful, when you aren't sure what to expect. We understand that and will carefully explain our procedures and address your questions. At Timber Springs Dental, you will have ample opportunity to express all of your cares and concerns about your dental care with Dr. Linger. She and her team want you to have a positive experience. It's important that you come to know that dental visits can be fun, happy experiences under the right circumstances. Dr. Linger has a great chairside manner. She enjoys getting to know her patients in a personal way. She cares about each and every one of her patients addressing the concerns unique to each individual. Dr. Linger takes pride in the fact that her practice revolves around personal attention to the patient. Contact us today to schedule a consultation with Dr. Linger. At Timber Springs Dental in Humble, TX you and your family will find patient amenities to make you and your family’s dental experiences the most enjoyable it can possibly be. You can enjoy watching a flat-screen TV or listening to your favorite music while you or a member of your family receives dental treatment. We believe the difference is in the details! Your comfort is our top priority. If you feel that you need assistance with relaxing during your visit, in most cases, we’re able to provide laughing gas as an option to help you feel more at ease. This safe and easy dental sedation option helps you get comfortable, and can be especially helpful for children and adolescents who experience dental anxiety. Laughing gas can also make dental visits easier and provide a better experience for patients with mental or physical impairments. When we explore laughing gas for you, we will review your health history, including medications you are taking and habits such as alcohol consumption and smoking. We take all factors into careful consideration when planning for your treatment, and we’ll go through the proper preparation steps with you prior to your visit at our Humble, TX dentist office. Your comfort and safety are our first priority. Timber Springs Dental is one of the few practices serving the Humble and Atascocita, TX area using the DentalVibe, which is a high-tech device that provides soothing vibrations to the gums during an injection. With the use of the DentalVibe device, you won’t even realize that you have received a shot! How does it work? Vibration signals travel to the brain faster than pain signals do, so DentalVibe’s vibrations reach the brain first and essentially block the sensation of pain from ever being felt. The result is astounding to most patients, especially for those who have always felt fearful of dental injections. You will be amazed and feel truly thankful for the amount of comfort felt during your procedure. Come in and experience the difference for yourself! When we take care of you and your smile, we want you to feel comfortable every step of the way.